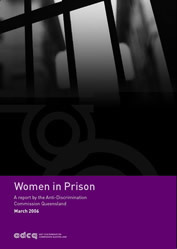 In June 2004, the Anti-Discrimination Commission Queensland received a submission from the advocacy group for female prisoners, Sisters Inside Inc. Of concern to Sisters Inside was the treatment of female prisoners generally, in particular Indigenous women and women with disabilities within the Queensland corrections system. The Commission conducted a review to research and consult on the treatment of women in Queensland prisons on the basis of gender, race and disability. In conducting this review the Commission relied on sections 235 and 236 of the Queensland Anti–Discrimination Act 1991 . The Women in Prison report was released in March 2006. A list of acronyms used in the Women in Prison Report is available at Appendix D of the report.